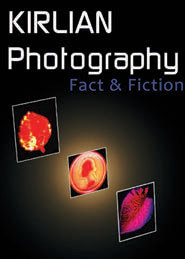 Interested in Kirlian photography, then this DVD is for you. 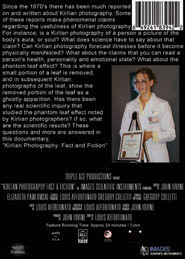 It provides the history, mythology, science and illusion of Kirlian photography package into this documentary DVD. Since the 1970's there has been much reported on and written about Kirlian photography. Some of these reports make phenomenal claims regarding the usefulness of Kirlian photography. For instance; is a Kirlian photography of a person a picture of the body's aura, or soul? What does science have to say about that claim? Can Kirlian photography forecast illnesses before it become physically manifested? What about the claims that you can read a person's health, personality and emotional state? What about the phantom leaf effect? This is where a small portion of a leaf is removed, and in subsequent Kirlian photographs of the leaf, show the removed portion of the leaf as a ghostly apparition. Has there been any real scientific inquiry that studied the phantom leaf effect noted by Kirlian photographers? If so, what are the scientific results? Special Bonus Kirlian Photography Device Instructional Video Included on DVD.